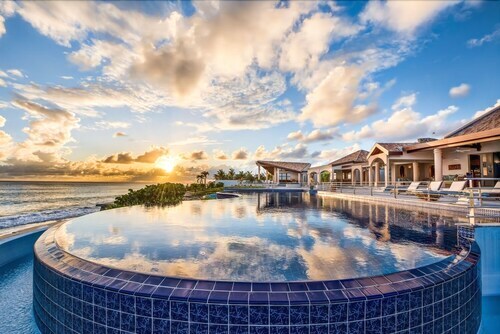 Best hotel on the island of St. Martin. Upscale, private, wonderful service and beautiful beach! Situated in Les Terres Basses, this golf villa is 0.1 mi (0.1 km) from Long Beach and within 3 mi (5 km) of American University of the Caribbean and Maho Beach. Plum Bay Beach and Cupecoy Beach are also within 1 mi (2 km). 5-6 Bdr Villa! Beachfront Veranda! Concierge Service & 1 Year Priority Pass! Situated on the beach, this villa is 0.1 mi (0.1 km) from Long Beach. Situated in Les Terres Basses, this luxury villa is steps from Long Beach and Plum Bay Beach. Red Bay Beach and Mercure Beach are also within 3 mi (5 km). 1 Bedroom West Indian Style Home With Lovely Arches on the sea Side is Located Directly on Baie L.. Situated on the beach, this romantic property is steps from Plum Bay Beach and Long Beach. Red Bay Beach and Mercure Beach are also within 3 mi (5 km). Situated on the beach, this romantic villa is 0.1 mi (0.1 km) from Long Beach and within 3 mi (5 km) of American University of the Caribbean and Maho Beach. Plum Bay Beach and Cupecoy Beach are also within 2 mi (3 km). Situated in Les Terres Basses, this luxury villa is within a 10-minute walk of Long Beach and Plum Bay Beach. Cupecoy Beach and Blue Mall are also within 2 mi (3 km). Situated in Les Terres Basses, this luxury villa is 0.1 mi (0.1 km) from Long Beach and within 3 mi (5 km) of American University of the Caribbean and Maho Beach. Plum Bay Beach and Cupecoy Beach are also within 2 mi (3 km). Situated by the ocean, this romantic property is 0.5 mi (0.8 km) from Plum Bay Beach and 2.6 mi (4.2 km) from American University of the Caribbean. Red Bay Beach and Long Beach are also within 2 mi (3 km). Situated near the beach, this villa is 0.3 mi (0.4 km) from Long Beach and 2.4 mi (3.8 km) from American University of the Caribbean. Plum Bay Beach and Cupecoy Beach are also within 2 mi (3 km). Situated in Les Terres Basses, this golf villa is within a 15-minute walk of Plum Bay Beach and Red Bay Beach. Mercure Beach is 2.4 mi (3.8 km) away. Arranging a trip to Long Beach and looking for accommodation close by? You'll find it in Maho Reef, approximately 100 miles (161 kilometers) outside of the nation's capital, St. John's. For quick and easy access to Long Beach, you can get a room at one of the 12 hotels that are within 2 miles (3 kilometers). Many travelers like the Belmond La Samanna, Sonesta Maho Beach All Inclusive Resort Casino & Spa and Sapphire Beach Club Resort, 0.5 miles (0.8 kilometers), 2 miles (3 kilometers) and 1 mile (2 kilometers) away, respectively. There's almost no end to the number of ways to spend your money while you're on vacation. If you're not particular about where you stay, why not reserve a room at one of the low cost places? You might like to check out the Villa Grand View which is only 0.9 miles (1.4 kilometers) away. An alternative solution is the Grand View Guest House, just 0.9 miles (1.4 kilometers) away. You'll find a handful of top-end hotels within easy commuting distance, perfect in case you're feeling indulgent. The Sonesta Great Bay All Inclusive Beach Resort, Casino & Spa and Divi Little Bay Beach Resort are ideal. There's really nothing like the serenity of listening to the songs of the seabirds. Take some time out and appreciate seeing the sun reflect on the glistening water at Plum Bay Beach. Get the family together and head to Cupecoy Beach, where you can frolic in the water to your heart's content! There's really nothing like the peacefulness of sitting beside the water. Take some time out and simply enjoy seeing the sun reflect on the water at Red Bay Beach. Claim a seat at the table at Starz City Casino if you love glitz and glamour and the exhiliration when the slots are whirring. Find out what university lifestyle is like in another city when you visit American University of the Caribbean. Ensure you arrange to come on one of the days when the college is open to the public. How Much is a Hotel Room in Long Beach? Hotels in Long Beach start at $545 per night. Prices and availability subject to change. Additional terms may apply. 2 Bedroom West Indian Style Home With Lovely Arches on the sea Side is Located Directly on Baie L..